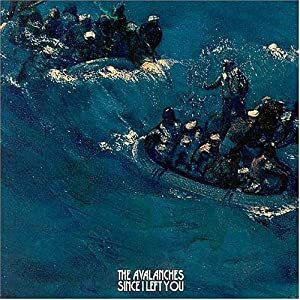 Since I Left You is an album by the Australian band The Avalanches of which someone just recently enlightened me. It’s comprised of over 3500 vinyl samples. As a tribute I thought I’d write this review. It’s comprised of over 500 pitchfork superlatives. The album is a testament to The Avalanches’ colossal musical geekdom. They didn’t ‘single-handedly invent’ sampling, or even sampling on this kind of scale. But sometimes the subtlest revolutionaries are the musical followers. The first incarnation of the record was pieced together from thousands of vinyl samples and the band actually managed to release this version before the cultural gatekeepers could raise the proverbial drawbridge. But due to intellectual property laws, the album underwent a global revision in which each and every sample was broken down and reconstructed by (proverbial) hand. As a result of this reinvention, there is right now a second, more widely-available copy, tupper-ware fresh and lacking the soul of the first. Don’t be mistaken. These crate-diggers unearthed a treasure trove of forgotten gems and rescued many artists from obscurity. The band is a somewhat contradictory creative entity: They assembled a microcosm of our shared musical history by composing other people’s work. They’re musicians, but they’re scholars too. The work winds up paying homage but they still manage to personalize the material. Each song is composed of warring symphonic arrangements. Somehow, they imbue the mundane with a sense of wonder. Disconnected images smeared and tossed around, shading emotions together that then coalesce in an escalating upward spiral filled with tiny epiphanies, resonating to the heavens. You can say that the record is a medium for ideas rather than a release from boredom. And from an outsider’s perspective, it’s easy to imagine that this sort of music might reject traditional listener participation, but after a listen-through it’s hard to imagine more accessible songs. They eschew the dymaxion principle in favor of exuberant swelling climax filled with gorgeous embellishments. It’s an electrifying hodgepodge of collaged phrases. It’s a study in excess. It’s maximalism. It’s life-affirming babble that careens toward an ecstatic gibberish steeped in mimicry. It’s a dream that pop music is having about itself.